Thank you for trusting Dr. Amy Mok, O.D. with your vision needs. A thorough eye exam is more than getting a prescription for your vision. Your eyes are also a window into your overall health. Dr. Mok is dedicated in providing all your eye care needs including eye exams, contact lens exams, Corneal Refractive Therapy, LASIK and cataract evaluations and treatment of eye diseases. Making an effort to get to know you as well as your eyes, Dr. Mok commits the necessary time to care for each of her patients and offer a pleasant and comfortable experience. Regardless of previous exams, Dr. Mok will thoroughly check your vision to dial in the best options for your visual needs today. Whether a new patient or an existing one, Dr. Mok will take the time to discuss with you any options to improve or maintain your eye health. Most of us who have healthy eyesight are extremely attached to our vision, often without being conscious that we are. We depend heavily on our eyes, and yet we rarely give them a second thought. Meet Dr. Amy Mok, O.D. Dr. Amy Mok was born in Hong Kong, but has been a native of Nevada since she was six years old. She was raised in Reno, graduated from McQueen High School, and completed her Bachelor of Science in Biochemistry at the University of Nevada, Reno where she did two years of biochemical research before attending optometry school. In 1999, she graduated from UCB and practiced in Las Vegas until October 2016, when she moved to Denver, CO to be closer to family. She is board certified in the treatment and management of ocular disease and she is affiliated with the Honor Society of Phi Beta Kappa and the International Optometric Honor Society of Beta Sigma Kappa and also the American Optometric Association and the Nevada Optometric Association. Graduate from University of California, Berkeley School of Optometry with a Bachelor of Science in Biochemistry at the University of Nevada, Reno. 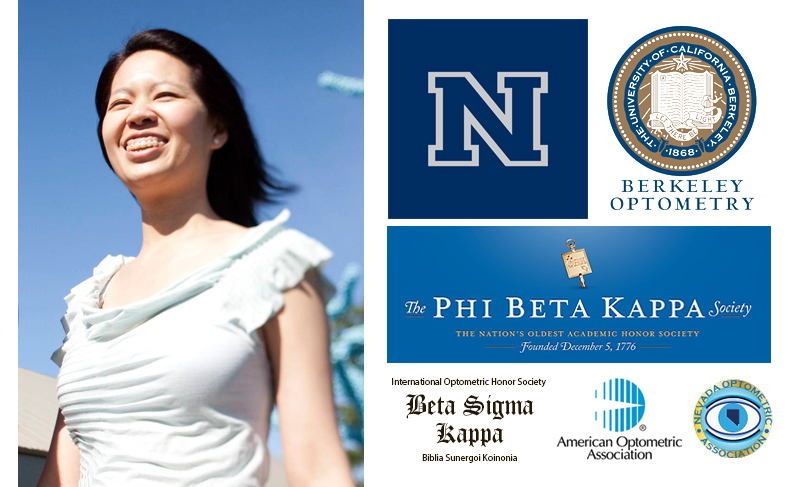 Affiliated with the Honor Society of Phi Beta Kappa and the International Optometric Honor Society of Beta Sigma Kappa. Board certified in the treatment and management of ocular disease, and affiliated with the American Optometric Association and the Nevada Optometric Association. In her spare time she enjoys yoga, hiking and traveling – the last of which serves as a reason for her to learn multiple languages. She currently speaks Cantonese, English and is working on her fluency in Spanish. Dr. Mok respects and takes your privacy rights seriously. To read and/or download a copy of the HIPAA Privacy Practices in a PDF format, click HERE. Congratulations to Amy Mok, OD on being the on top Optometrist in Las Vegas ranking of 2015. There is nothing invisible in this universe! There is only our lack of eyesight! We are providers for the following Vision Insurance plans, but may not be for all policies of these Vision Insurance plans. Vision and Medical Insurance are not the same so please contact your Human Resources Department to verify your Vision Insurance and we will be happy to get an authorization with your Vision Insurance when you make your appointment. Please contact us by phone at 303-278-0577 if you have any questions and have your Vision Insurance information available. We also offer vision discounts to seniors who have a valid AARP card at the time of their appointment. MAKE SURE TO CALL & SCHEDULE YOUR APPOINTMENT TODAY! In preparation for your appointment, please bring proof of vision insurance, your current glasses and/or contacts or their prescriptions, and a list of vitamins as well as over-the-counter & prescribed medications you are currently taking. Download and complete our Patient Registration Form before coming in. Also please download and sign the Lenscrafters & Dr. Amy Mok O.D. – HIPAA Policies and Consent Forms before coming in. If you are Diabetic, please make sure that your blood sugar is controlled, as not doing so will alter your prescription reading – making it inaccurate. Also please prepare to be dilated and have someone available to drive for you after the appointment. Contacting Dr. Amy Mok O.D. Dr. Amy Mok O.D. is dedicated to providing all your eye care needs including: Eye Exams, Contact Lens Exams, Corneal Refractive Therapy, LASIK and Cataract Evaluations and Treatment of Eye Diseases. Or you can e-mail Dr. Mok using the contact form. We Dr. Amy Mok O.D. Powered by Optic Dimensions © 2016. All Rights Reserved.